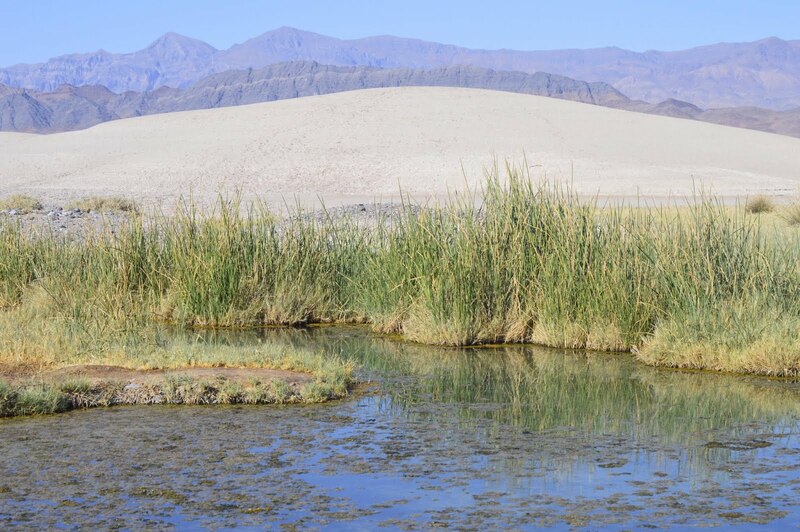 Tecopa is a desert oasis about two miles south of the Town of Shoshone, CA at the very southern end of Death Valley. It sits on an earthquake fault and the water comes out of the earth hot. 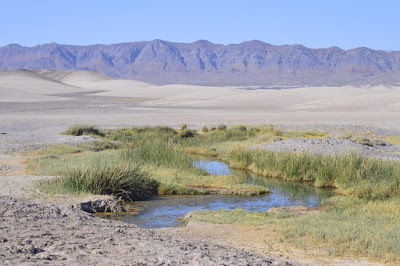 The photos (below) are what Tecopa looks like today. I suspect from all historical evidence that this is very much what it looked like 1000 years ago. Which is to say that man's attempt to change the place was unsuccessful by in large (note the recent history below). There's a small resort that was built up around the springs. Go or don't go. I don't want to bad-mouth anyone...but it's not the sort of place I'd spend money. However your journey of exploration doesn't have to end at the walls and boundaries of the little desert baths (in poor repair). You can also explore the oasis itself, which extends well beyond the limits of private land onto BLM land. The Old Spanish Road/Mormon Road passes Tecopa. If you're following the old trail, you can't help but find it. 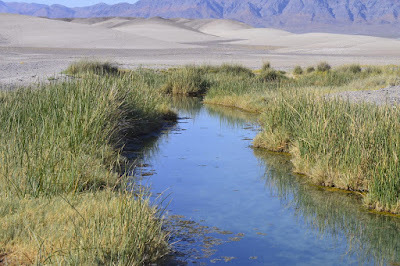 The springs are part of the subterranean system of waterways fed by the mostly subterranean Amargosa River. 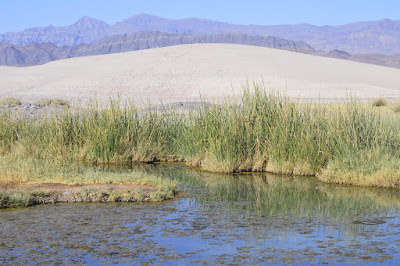 The nearest oasis to Tecopa is Resting Springs, the old wagon stop. In the spring of 1875, brothers William D. and Robert O. Brown, found rich but difficult-to-work lead and silver ore in the hills near Resting Springs. Several months later, in August, the brothers and several San Francisco capitalists, including George Hearst, incorporated the Balance Consolidated Mining Company. Then the Browns laid out a townsite at a trickle of water named Willow Creek, six miles southeast of Resting Springs. Thirty-five miles away, in Nevada, they installed a sawmill in the Charleston Mountains, where abundant white pine timber was available. It took a lot of effort to build a "town", destined to become a ghost town when the silver ran out, but the brothers Brown had a lot of ambitions to be land barons as well as silver barons. As was the case with many places in Death Valley, the key to victory was in selling mining shares. They took some samples of oar to a San Bernardino Hotel where they set up their sales office (for mining shares not oar) The samples assayed at $900/ton for silver. By the spring of 1877, they incorporated the Los Angeles Mining and Smelting Company and the Browns sold off their interest to an investor named Osborne. At first, Osborne's efforts looked promising. Ten miners had sunk the Gunsight's shaft to 385 feet by January, 1878. The smelter, meanwhile was fired up; employing 30 men, it turned out 67 bars of bullion during its first night. The smelter became a demanding operation — too demanding. It required as many as 44 men to provide fuel, ore, and repairs. And a chronic shortage of water made the furnace overheat, crack the cooling jackets, and shut down in a burst of steam. Then, too, as the Gunsight went deeper, the ore changed from easy-to-smelt galena (lead sulfide) to refractory lead carbonate. For the next few years, the Resting Springs district fell into a fitful slumber, occasionally awakened by the introduction of some piece of milling machinery or mining method. In the fall of 1878, Osborne bought a costly, unproven rotary crusher called the Davis Pulverizer, which he installed at Resting Springs. The machine soon failed. After the company refused to make the final payment, the manufacturer briefly attached its properties. Now debt ridden, the company reluctantly began to levy heavy assessments. William Welch, the sheriff of Inyo County, considered Tecopa a costly mistake since “it costs five cents a pound freight from San Bernardino here…” Resting Springs, Welch found, was “quite a nice little place of some thirty white population and double that number of aborigines…” The camp was smaller than Tecopa, comprising only one store, a blacksmith shop, a “gin mill or two,” several houses and miners shanties, and the Osbornes' “superior dwelling,” which stood near a small, clear stream. Nearby were two reservoirs, one of them used for bathing. The camps were remote:140 miles by road from Mojave and about 180 to 200 miles from San Bernardino. The fastest round-trip between Independence, in Inyo County, and Resting Springs took 22 days. On one trip, Welch, the Inyo County sheriff, met no people or travelers at all. The isolation only intensified the oppressive weather. On a trip in April, 1880, bitter, chilling winds made travel and sleep almost impossible for photographer W.A. Vale. “I bet there was a peck [of sand] in the Stage that drifted in Since Morning,” he wrote in a diary. When Luckhardt, the superintendent, departed in August, the mercury “played such frolicsome little pranks as rising to 116° in the shade....” Several months later, the pony rider again became crazed and lost the mail. Many travelers were no doubt aware of the heart-rending tragedy that had befallen stable owner W. R. Cornman in September, 1877. After having registered voters at Tecopa, Cornman became lost while returning to San Bernardino. Dying of thirst and starvation, Cornman lay down under a bush and shot himself in the head. Even though the ore had proven value, the cost of hauling and processing it (overhead) exceeded the value. After the Tonopah and Tidewater Railroad was built within a few miles of Resting Springs in 1906, the mines were successfully worked until 1928. By then, they had produced nearly $4 million in lead and silver ore.
Today there's nothing left but some abandoned mine works and of course, there is the oasis.